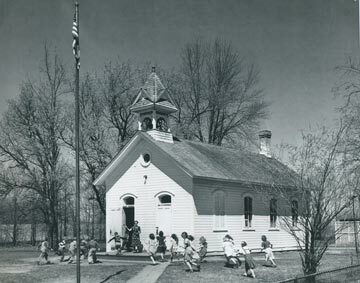 The Marty School in circa 1950. If you have photos or memories of this school to share, contact us. MODERN ADDRESS Located at Hudson Rd. at Lake Elmo Rd. DISTRICT BOUNDARIES Loss of territory in the district in the 1860s caused the school to be relocated to the west of its original location. DISPOSITION School has been moved. Enrollment in 1861: 40 students and in 1898: 37 students. MEMORIES: “The old school in District 37 was not painted. It had only one door and four windows with old-fashioned shutters. For the teacher’s desk there was an ordinary table. The big boys stayed home and helped their parents from April to November. At noon hour while teacher went home for dinner, the boys played their harmonicas. They had no report cards, the last day of school they received awards of merit. They had big desks so 2 could sit in them. They had no grades. 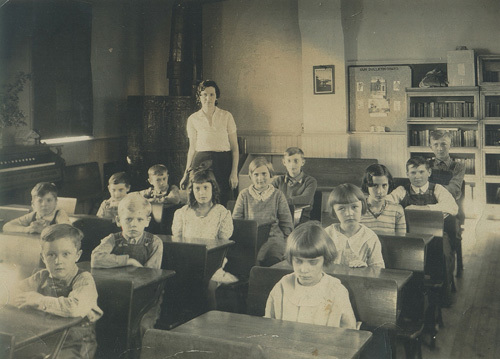 Third reader was the highest anybody went to school… The school stood one mile northwest from where it is now.” -Leslie Krongard, The Rural School News of Washington County, March 1939. Other teachers: (before 1898): Marion Grady, Anna Scott, Ellen Roe, Maudie Downs, Mary Hummell, William Bush, Caroline Henning, Adeline Pauley, Ida Reier. Marty School students in the 1950s.